Following two successful modules held in the autumn-winter of 2016 and spring 2017, our Romanian language course continues with more fun activities and language discoveries. Held at the welcoming premises of 1 Belgrave Square, the third module is aimed at those who have already acquired some basic knowledge of the language and offers a thorough introduction to contemporary Romanian, while revising previously acquired notions of vocabulary and grammar. During the first two modules, the students covered a few basic grammatical constructions (the gender and number of nouns, the definite article, the adjective, basic verbs in the present tense, interrogative and negative, the possessive adjectives, reflexive verbs, ordinal numbers), as well as an essential working vocabulary (greetings, presentations, professions, where are we from and where do we live, numerals, dates and hours, the days of the week, the months in a year and the seasons, the age, prices, adjectives and the description of common objects, the weather, modes of transportation, likes and dislikes, food and drinks, at the restaurant, talking about family, going shopping, going by taxi, getting a room in a hotel). The course is taught in English and Romanian with coverage of the four skills of speaking, listening, reading and writing, and a balance between communicative activities, structure practice and grammar. And to spice up the language experience, we invite you to get a taste of our rich and diverse culture by attending our exciting events. To find more about our cultural programme, please check this website or subscribe to our e-newsletter. Duration: 10 weeks with 1 meeting/week and 2hrs/meeting; starting on 2 October and ending on 4 December. The next module will begin in the spring of 2018. 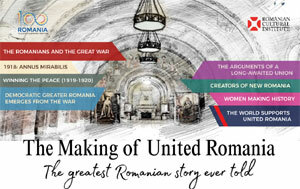 Course materials (handouts) included in the fee, except manuals, which can be purchased from Cărţi Româneşti UK (https://cartiromanesti.co.uk/gb/) based on a prior order. Laura Manu graduated from the Faculty of Letters of the University of Bucharest, where she studied English and Italian language and literature. She has been living in the UK for 26 years and has been lecturing in Romanian language at the University of Westminster since 1995. Laura worked for the Romanian language service of the BBC World Service and, after training in psychotherapy, she started working as a psychotherapist in a private practice and with the NHS. Alongside her freelance activities in dubbing and voice over, she combines her interest in psychoanalysis and film working as a consultant for Romania at the European Psychoanalytic Film Festival (London).